DreamWorks signs Scarlett Johansson onto a Ghost in the Shell live-action film adaptation, but the film needs to get off the ground. Following up on this year's action movie Lucy, Scarlett Johansson has signed on to DreamWorks' live-action film adaptation of the animated film Ghost in the Shell. Cyberpunk Ghost in the Shell, which was originally a manga, follows Motoko Kusanagi, a cyborg who's the squad leader of the Japanese National Public Safety Commission, tasked with fighting technology-related crime. Johansson, who also plays Black Widow/Natasha Romanoff in the Avengers films, has growing star power associated with her name. Women-led stories in films have a hard time getting off of the ground compared to the many male-dominated films, but Johansson has proven she's a formidable action star, especially with Lucy making $394 million worldwide. Her involvement could lead to this film adaptation of Ghost in the Shell getting greenlit. It is a disappointment, however, that an Asian actress may not be playing Motoko Kusanagi. DreamWorks principal Steven Spielberg is a fan of the original animated film and has wanted to get this project off the ground for a while, Variety reports. Rupert Sanders (Snow White and the Huntsman) is on board to direct the film. Paramount could come on as co-producer and financier, but there's no firm decision on that yet. Ghost in the Shell first arrived as a manga in 1989 and was later adapted into an animated film in 1995. In 2002, the same animation company created a television anime series, Ghost in the Shell: Stand Alone Complex. Most recently was the film series, Ghost in the Shell: Arise, four 50-minute animated episodes that completed in 2014. 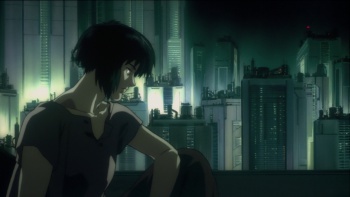 Each adaptation has a slightly different take on Kusanagi and the story, so it will be interesting to see where DreamWorks' live-action adaptation would go.